U.S. Treasury Secretary Steven Mnuchin, whose background includes the financial side of movies, said Sunday it’s a compliment being compared to a James Bond villain. “I guess I should take that as a compliment that I look like a villain in a great, successful James Bond movie,” Mnuchin told host Chris Wallace in an interview today on Fox News Sunday. Background: Last week, Mnuchin and his wife, actress Louise Linton, were looking at the first U.S. dollars printed with his signature. They posed for a photograph distributed by The Associated Press. The photo went viral on social media with people making the comparison to 007 villains. “What were you thinking?” Wallace asked Mnuchin today about the photo. Here’s how AP photographer Jacquelyn Martin described what happened in a story run by the news service. The media had been told that Mnuchin would first look at stacked sheets of new bills. He was taking a look at some as they were processed, when he was passed a sheet of bills to inspect. Then he turned to the camera and held up the bills, which I hadn’t expected him to do so early in the tour. Mnuchin turned his head and gestured to Linton to join him. 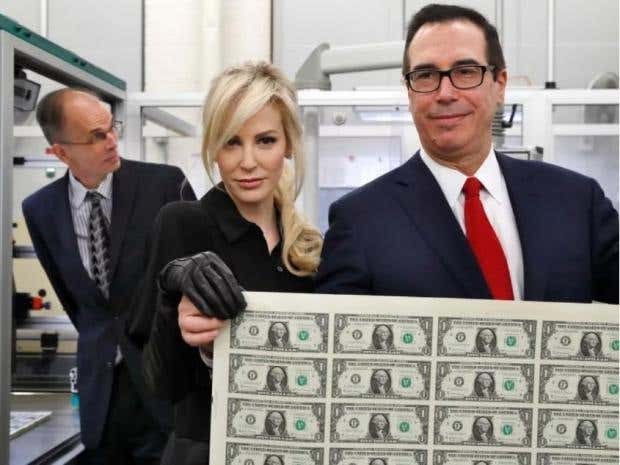 He then had her help him hold up the sheet of bills for the photo. 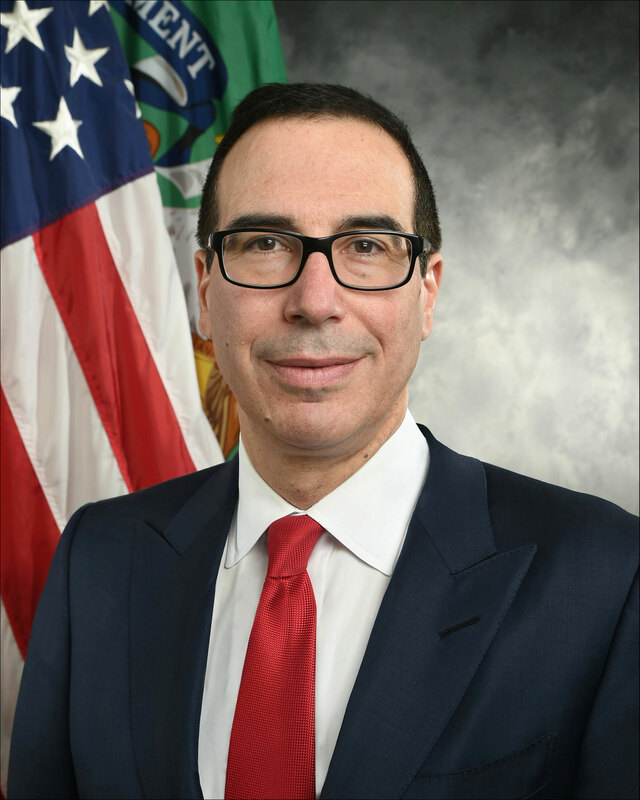 Mnuchin formerly was involved with RatPac-Dune Entertainment, which has co-financed a number of Warner Bros. movies. As a result, he has received a number of executive producer credits on those movies. Among them: The Lego Movie, Batman v Superman: Dawn of Justice, The Man From U.N.C.L.E. and Wonder Woman. Mnuchin, 54, divested his stake in the company earlier this year. RatPac-Dune has been in the news because another principal, Brett Ratner, has been accused of sexual misconduct. 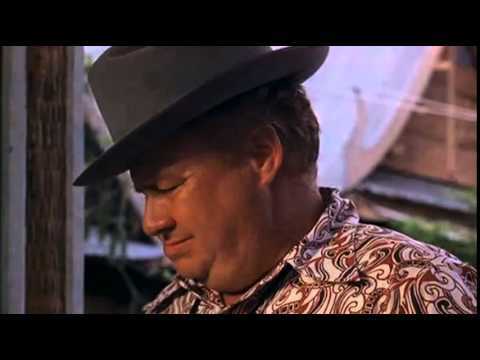 Clifton James, a character actor whose career extended more than 60 years but perhaps best known as a redneck sheriff in two 007 films, has died at 96, according to an obituary by The Associated Press. James embodied a 1970s shift in James Bond films to a lighter, more comedic tone. He played Sheriff J.W. Pepper, a Louisiana lawman who was comic relief in 1973’s Live And Let Die and 1974’s The Man With The Golden Gun. “What are you, some kind of doomsday machine, boy?” James’ Pepper says, emerging from a wrecked police car and confronting Roger Moore’s James Bond following that film’s massive boat chase sequence. J.W. Pepper was created by screenwriter Tom Mankiewicz. In the documentary Inside Live And Let Die, the scribe said he didn’t want the audience laughing at the African American villains in the film. Clifton James as J.W. Pepper fit the bill. James said in the documentary he wore padding to make himself look heavier. The character was brought back for Golden Gun. In one January 1974 draft, by 007 veteran Richard Maibaum (who took over for Mankiewicz), Pepper only had a small appearance. James, however, was far more than J.W. Pepper. He easily made a convincing villain in various television series. He also played cheapskate Chicago White Sox owner Charles Comiskey in Eight Men Out , a drama about the scandal when the baseball team threw the 1919 World Series to the Cincinnati Reds. 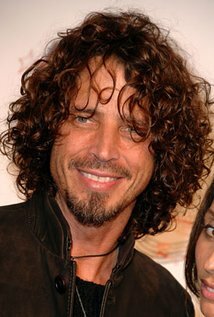 James’s IMDB.COM ENTRY lists 100 acting credits from 1954 to 2017. UPDATE (6:05 p.m., New York time): Roger Moore took to Twitter to note the death of Clifton James. Terribly sad to hear Clifton James has left us. As JW Pepper he gave my first two Bond films a great, fun character. UPDATE II (April 16): The official James Bond Twitter feed published a post about the actor’s passing. George Smiley is returning in a new novel by John Le Carre, THE ASSOCIATED PRESS REPORTED. The news service quoted Viking, Le Carre’s publisher, as saying the author’s new novel, A Legacy of Spies, will debut Sept. 5. “According to the publisher, the novel tells of how Smiley and such peers as Peter Guillam receive new scrutiny about their Cold War years with British intelligence and face a younger generation that knows little about their history,” AP reported. 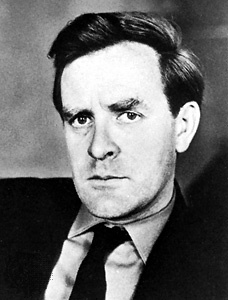 Smiley appeared in a number of Le Carre novels, including Tinker Tailor Soldier Spy, Smiley’s People and, most recently, 1990’s The Secret Pilgrim. In some novels, he’s a primary character, in others a secondary one. Smiley has been portrayed by several actors, including Alec Guiness and, most recently, Gary Oldman in a 2011 film adaptation of Tinker Tailor Soldier Spy. Ringling Bros. and Barnum & Bailey Circus will shut down in May, The Associated Press reported. 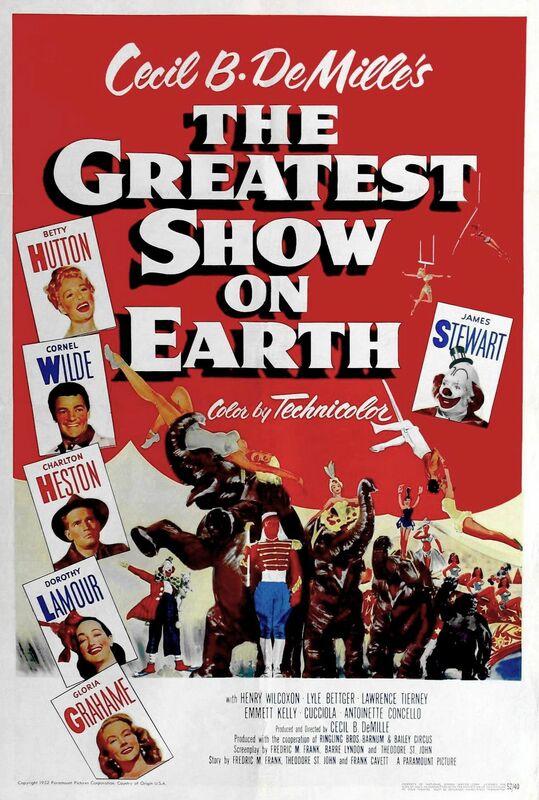 Its demise recalls the kind of movie you don’t see in the 21st century: The Greatest Show on Earth (1952). Greatest Show won the Best Picture Oscar, beating out High Noon, Ivanhoe, Moulin Rouge and The Quiet Man. It’s hard to imagine Cecil B. DeMille’s mix of spectacle, soap opera, comedy and other elements even being made today, much less nominated. Gruff circus boss Charlton Heston tries to keep the circus rolling while circus acts Betty Hutton and Gloria Grahame are in love with him and new star attraction Cornel Wilde causes a lot of trouble. And there’s James Stewart’s mysterious clown who never takes his makeup off. DeMille himself is a presence, narrating the film. The movie was also an early example of product placement. It was produced in cooperation with Ringling Bros, with circus executive John Ringling North playing himself. It also has cameos from the likes of Bob Hope and Bing Crosby watching a circus performance and Edmond O’Brien as a midway barker at the end. In real life, the circus already was facing changing times when Greatest Show was released. One of the plot points is how some circus management want to end circus big tops and keep to major cities. The circus ceased staging performances in tents in 1956. The demise of the circus was also due to changing times, according to the AP story. Nothing lasts forever. Ringling Bros had a good run at 146 years. For those who haven’t seen the 1952 movie, this extended trailer gives you a sense of what the film was like. 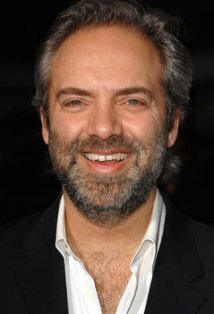 Sam Mendes, who helmed Skyfall and SPECTRE, said, according to The Associated Press, that he won’t be directing Bond 25. Mendes revealed his plans to step down from the series to an audience at the Hay Festival of literature in Wales. A former theatre director whose films include the Oscar-winner “American Beauty” and the somber “Revolutionary Road,” Mendes said he hoped the next Bond director would come from an “unexpected direction,” just as he had. Of course, this isn’t the first time Mendes has made such comments. In 2013, he said the idea of directing a sequel to 2012’s Skyfall made him feel “physically ill,” but he directed the next Bond movie, SPECTRE, anyway. Pay raises have a way of calming the stomach. In July 2015, he told the BBC he “probably” would not direct another 007 film. Regardless, Mendes’ latest comments are worth noting given how the Bond film series is in flux. Bond 25, as of now, has no leading man (Daniel Craig hasn’t said if he’s coming back or not), no director, no script and no distributor. Metro-Goldwyn-Mayer, following its 2010 bankruptcy, doesn’t have the resources to release a Bond movie on its own. Sony Pictures, which released the last four 007 films, saw its contract with MGM expire after SPECTRE. And, for now, the world goes round and round, albeit without a firm schedule for the return of agent 007. UPDATE: The AP story has this passage, which raises questions. Mendes said lobbying by fans is pointless because the decision will be made solely by the series’ producer, Barbara Broccoli. “It’s not a democracy … Barbara Broccoli decides who is going to be the next Bond, end of story,” he said. Does Michael G. Wilson, co-boss of Eon Productions, not have a say?